Recently a local student and RIFT player reached out to ask for a little bit of information about game writing and world building to use in a school project. Captain Cursor, our resident lore expert (with an unusual job title) graciously agreed to answer their questions. When we got a chance to read over his answers, we realized this provided an excellent behind-the-scenes look at what it’s like to write lore for RIFT! To get started, what’s your role on the RIFT Team? What do I do as part of the RIFT team? I touch a lot of parts of the game. There’s brainstorming up new concepts in the game: where are we going next, who are we fighting next, what will the next adventure bring? Other times I act as a resource to other members of the team who want to ground what they are doing in the lore of the game. I help the dungeon team connect their maddening fights with the lore of the game, which is especially challenging when they are working in parallel with the development of the lore. I write most of the short stories about the class lore which gets used for marketing the classes as well as with abilities and items related to the class. I’m also on hand to help brainstorm plots and vignettes with designers or answer cultural questions with the artists. And then every so often Daglar locks me in a room with the MTX team and won’t open the door until we name all the promotions. I’m also on the team that is working on the expansion to the Plane of Water, so there are quests to make, monologues to write, vignettes to stage, scenes to name, and mobs to place. I’ll also occasionally get grabbed into the recording booth to voice some of the NPCs (MEEEEEEEEEEAAAAAAAAAD!) or help direct the much more professional voice actors. Also there are puppet shows. Occasionally I get to make puppet shows. How long have you been on the RIFT Team? I joined Trion in 2008, back when RIFT was the “Heroes of Telara” team. Why did you join the RIFT Team? Was it just a job or did something draw you to it? When I joined the project the story of the game was drastically different. At the time I had been working on console games and had wanted to work with MMOs. I was involved with a modding project for Neverwinter Nights and was running a server where I had built out a custom world. I liked the long-term interaction with a community and the sense of creating a virtual space where people would live. This type of storytelling really interested me and I wanted to do more along those lines rather than the short-term cycles that I had been working on in console games. How does creating a world for a game differ from a printed piece? A work of written fiction is a creation of a singular vision. It’s just the writer and the page (and often a really good editor behind the scenes making the writer look good). A game is a giant collaboration between multiple artists, engineers, designers, musicians, actors, and other specialized craftsmen that are needed to bring the game to fruition. They are all part of the conversation. And that will help steer the game towards completion. Games also have different goals than just the story. When I started the game was called Heroes of Telara and it was very different than it is today. After we worked at for a few years we found that one aspect of the game we thought would be fun, the dynamic content, wasn’t. The rifts were born out of the necessity of redoing the way we inserted dynamic content into the game. The dynamic content was better when it was highlighted, when it stood out from the rest of the world, and when it became a focus of the player’s activity. So that changed what the story requirements needed to be. We had six types of elemental rifts, so we needed six villains for the story. We reused a lot of the monsters that would appear in the rift, so we needed reasons why the monsters were invading from the planes and also in the world. We had different designers writing their stories for their zones, quests and dungeons and we needed them to all fit while still giving people a chance to explore and be creative, so we created the cults that had different story themes. In the last class lore stories, I wrote “The Tenebrean living construct appeared to be an immense obelisk supported by spidery, buttress like limbs.” I hoped to create an image of a giant opponent bigger than the walls that tried to stand against it. That sentence took me a few seconds to write. The Volan fight, which is about where I’m imagining the scale of this monster, took several months of iteration back and forth between designers, artists and engineers. So while writing I don’t need to concern myself with things like draw calls, scale, limitations on physics, I just have to write an engaging tale (though I don’t mean to minimize the difficulty of achieving that). For writing the game I set creative direction for various groups, and then tie everything up once the teams have all put their own stamp on it. Where do you start when creating a new world or zone? Physical space or culture? RIFT Behind the Scenes with… RoughRaptors? 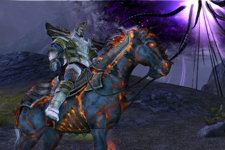 G4′s The MMO Report – RIFT Edition: Go Behind the Scenes! Become a Junkies Nation Writer!